Bagni di Lucca Villa has a large open-air swimming pool (open Jun-Sept, 10am - 7pm) with a smaller shallow toddler pool and a diving pool with 1 metre and 4 metre diving boards. All of these are fed with water from a thermal spring and are surrounded by deckchairs and sun umbrellas, use of which is included in the admission charge, and sun loungers, for which an additional charge applies. Admission is € 7 euro for adults and € 5 for children (3-13 years). As usual in Italy the use of swimming hats is compulsory. These are for sale, along with a selection of swimming costumes, in the reception area. Note that as there are no large lockers in the changing rooms it is not considered unusual if you take your clothes and other valuables to the poolside. The serious swimmer should best avoid peak periods during the summer as the outdoor pool tends to get busy. The whole pool area tends to get very crowded on sunny afternoons, making it difficult to find somewhere to sit, so it's often advisable to arrive either before 11:30am or after 4pm. There is a pleasant bar area above the pool with plenty of outdoor seating. A wide range of drinks and fresh snacks are available. During the winter months the indoor pool and a smaller teaching pool are open. The larger indoor pool is generally split into lanes and although often some of these are often in use for swimming or fitness classes the pool usually has some provision for general swimming. Much of Bagni di Lucca's past fame rested on its thermal spas and their healthgiving properties. 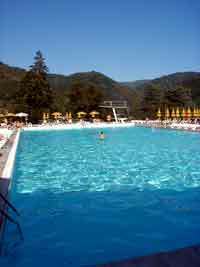 Most are now closed and their customers gone to larger spa towns such as Montecatini Terme. One establishment that is still open is the Terme Jean Varraud in the hills about La Villa. This offers a range of health and beauty treatments.